Our range of 'own label' solid chemical dissolvers and dispensers are ideal for the automatic treatment of boilers and cooling towers. Gravity feed solenoid activated solid chemical dispensers require no electricity, working instead form the internal line pressure. Low utility costs and decreased maintenance times produce lower operating costs, whereas the small physical footprint makes these units easy to handle and transport between locations. 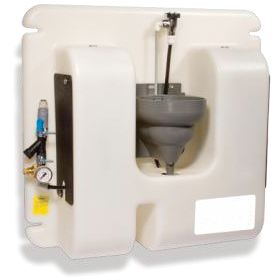 Fully serviceable with spares available, all our dispensers meet UK regulation/specifications. Need advice on what chemical dispenser solution best suits your needs, call us on 01495 792790. Need help choosing the right dispenser? Click here to view our range of Solid Chemical Dispensers/Dissolvers.